The aroma from its open kitchen hits your nostrils as you enter its vibrantly colourful confines. The décor has used elements of Oriental design aesthetics combining them with practicality. The seating arrangement…laid out in a semi-circular fashion…allows the customer a view of the activities inside. 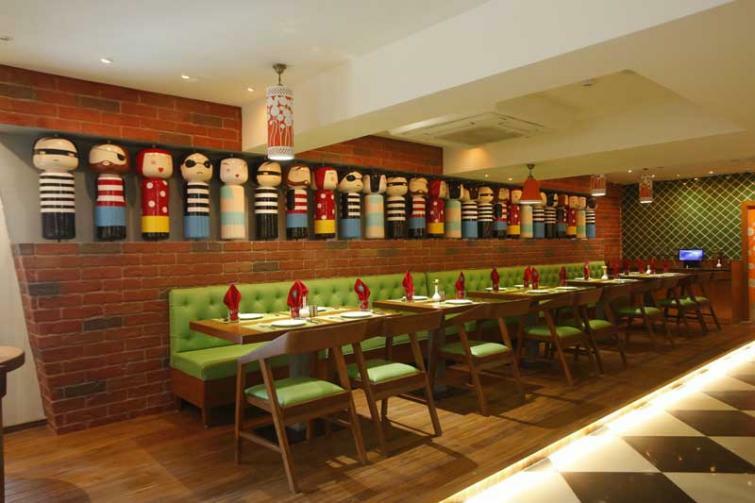 The two most interesting features are the rotating (inspired by the Tibetan prayer wheels) Japanese Kokeshi-like dolls lining a section of the wall space and the mini tempo stationed to the right of the entrance. The mini tempo is actually the drinks counter and has been inspired by the small vans used by the vendors selling pho (pronounced as ‘fuh’) and other food items in Vietnam. Though Pho is a popular street food of Vietnam it has travelled to many other countries to be listed on menu cards of speciality restaurants. Pho was originally sold at dawn and dusk by roaming street vendors, who shouldered mobile kitchens on carrying poles. A brainchild of Geetika Sinha, Friends of Pho has been inspired by her travels through Southeast Asian countries. Geetika is of the opinion that the concept of authenticity is slightly misplaced when it comes to food or art. “Take for instance food cooked at home”, explains Geetika,”every family kitchen offers a slightly different recipe for the same dish and yet all are equally delectable.” Hence, Friends of Pho may not adhere to specific Asian culinary sensibilities but instead offers a rich array of representative dishes from countries like Laos, Malaysia, Thailand, China, Cambodia, Burma, Indonesia, Vietnam and Singapore. One could say it is a very personal culinary journey that Geetika has undertaken. She has also curated the menu on offer. After sampling over 250 dishes prepared at the restaurant’s kitchen and under the able supervision of Chef Sujan Shresth, she shortlisted 130 items all of which are printed on the tastefully designed menu cards. A variety of soups are on offer alongside appetisers. Try the creamy Thai coconut soup Tom Kha settling to relish it with Crispy Water Chestnuts and Bamboo Shoots, Friends of Pho Special Crystal Veg, Shanghai Chicken Dumplings, Friends of Pho Special Chilli Chicken and the Indonesian Banana Leaf Wrapped Fish with Balinese Spices. You are spoilt for choice! The main course is equally interesting and explores a mix of vegetarian and non-vegetarian options, try out their Mutton Cooked in Laotian Bong Sauce…it leaves you craving for more. In fact, each of the dishes on offer, are a gourmand’s delight. Team your main course with rice or noodles of your choice! 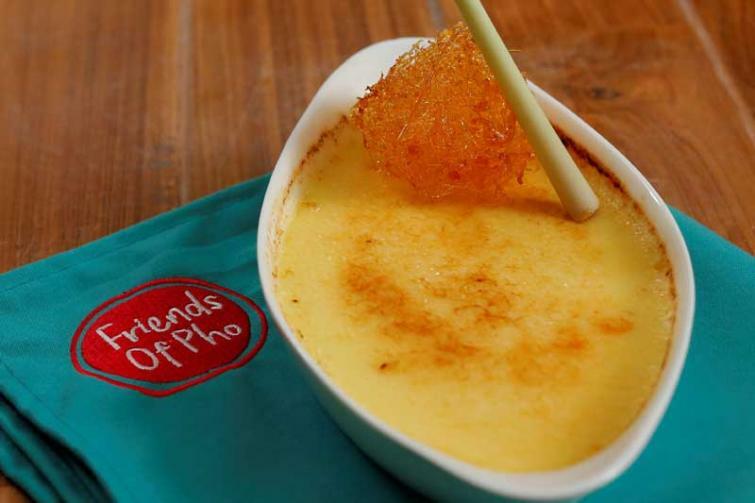 Finish your meal with a dessert—would highly recommend Lemon Grass Crème Brulee. METHOD: First we have to marinate the fish with all this ingredient and wrapped with banana leaf and then Grill for 25 minutes. METHOD: Take water in wok and add coconut milk than add all these ingredients and Thai paste and cook nicely for 10mintes. METHOD: - Cream, sugar, milk, egg and lemon grass mix and cook for 10 minutes. Stain all ingredients. Then bake for 60minutes.